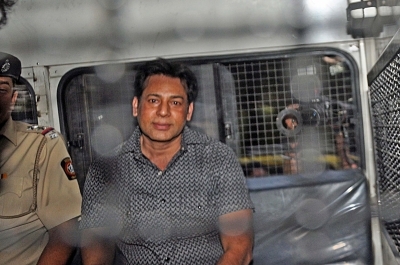 As expected, notorious mafia gangster Abu Salem A. Ansari, 50, was spared the death penalty and sentenced to 25 years imprisonment by Special TADA court Judge G.A. Sanap on Thursday for his role in the March 1993 Mumbai serial blasts. “As per the Extradition Treaty between India-Portugal, this is the maximum sentence permissible to him since the death penalty is banned in Portugal where he was first arrested,” Special Public Prosecutor Deepak Salve said after the verdict. One of the important clauses in the treaty between India and Portugal for extradition of Salem was an assurance by New Delhi that he would not be sentenced to death. Following this, Salem and his former actress girlfriend Monica Bedi – both arrested by the InterPol in Lisbon on September 20, 2002 – were finally cleared in February 2004 for extradition to India. The two were handed over to the Indian agencies in November 11, 2005. He was wanted in India to face trial in the March 1993 blasts case which killed 257 and injured 700 plus, besides several other cases filed against him all over the country. Nearly two years after he landed in India, the special TADA court in Mumbai filed eight charges against him and his accomplice Riyaz Siddiqui for their role in the Mumbai blasts case, including procuring the arms and ammunition from Pakistan to Gujarat and later dispatching them to Maharashtra’s Raigad. In September 2011, after Indian authorities slapped fresh charges on Salem that could attract the death sentence, Portugal accused India of violating the extradition treaty conditions and revoked his deportation. After the Lisbon High Court cancelled the deportation order, Portugal’s Supreme Court of Justice questioned the legal rights of the Indian authorities to challenge the cancellation of the extradition order. In 2015, Salem had moved the Administrative Court in Portugal seeking direction to the Portuguese government to execute the order of that country’s apex court cancelling his extradition. Inside the jails in Maharashtra, Salem barely remained out of the limelight, once when he was shot at by an inmate inside the Taloja Central Jail in Raigad on June 27, 2013, and on another occasion, when he was attacked by an inmate with a metal spoon inside the Arthur Road Central Jail, Mumbai in July 2010. He survived both incidents with minor injuries, but left the jail authorities shaken. There were reports that he lived a lavish lifestyle inside the jail. In 2015, a 26-year-old woman approached the special TADA court in Mumbai seeking permission to marry Salem. The two had reportedly met on a train while he was being taken to Uttar Pradesh in connection with a case. Incidentally, shortly after Thursday’s verdict, through his lawyer, Salem moved an application before the Special TADA Court asking that he should be shifted to New Delhi as he apprehended threat to his life in Maharashtra jails. Besides the March 1993 Mumbai blasts case, Salem has already been sentenced to life in February 2015, in the builder Pradeep Jain’s murder case of March 7, 1995 at Juhu. Earlier on Thursday, Special TADA Court Judge Sanap sentenced to death penalty two convicts, pronounced life sentences to two others, including Salem and 10 years jail to one accused in the Mumbai 1993 blasts case. Mohammed Taher Merchant and Feroze Khan were sentenced to death for their role in the blasts. Salem and Karimullah Khan were awarded lifers while a fifth convict Riyaz Siddiqui was given 10 years rigorous imprisonment. All the six accused, including Mustafa Dossa, were pronounced guilty by the Special Court on June 16. Dossa, however died on June 28. The much-awaited verdict on the quantum of sentencing came 24 years after the March 12, 1993 serial blasts and nearly 80 days after they were found guilty by the Special Court. On a quiet afternoon of March 12, 1993, the country’s commercial capital was shattered by a series of 13 blasts in quick succession at various locations in the city and suburbs, creating the worst unprecedented mayhem in the country, killing 257 and injuring 700 others. The prime targets included the Air India Building, Bombay Stock Exchange, Zaveri Bazar, then existing five star hotels, Hotel SeaRock and Hotel Juhu Centaur, and others leading to damage to public and private properties worth Rs 27 crore.